This green chutney goes well with other like Ahloo Paratha. Green Chutney is an easy Indian recipe that goes well with a variety of food. This chutney is a delicious condiment that’ll really add flavor to the food you eat it with. 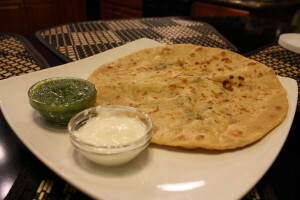 This recipe goes really well with any type of stuffed Indian bread along with different kinds of Indian snack foods. Liquefy until you get a green mix. Enjoy with your favorite Indian dish.